This sketch was difficult for me. For some reason, I just couldn't "see" what to do with it. 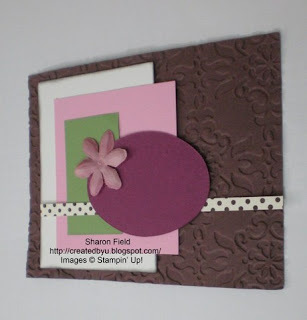 Usually, I have a stamp set in mind or a color scheme that seems like it will work. However for this one, it just didn't come to me. Until I turned it on it's side! When I saw it on it's side, then this Christmas theme came to me. I like the non-traditional Real Red and Baja Breeze colors. They look happy together! Now go to Brenda Taylor's blog to see her creation with the same sketch. www.memoriesbybrenda.com.